Democrat women planned to wear white at Donald Trump’s State of the Union speech last night in support of gender equality as the deep divisions in Washington DC were on display. Mr Trump’s guests included the family of a woman murdered by an illegal migrant, the manager of a sawmill that recently reopened and a former opioid addict, highlighting his own priorities. The disparity between the guests accentuated the yawning gap between the Republican and Democratic parties that exists while Mr Trump made bipartisanship a focus of his speech. The Democrats control the House of Representatives – the chamber where Mr Trump’s address was due to take place – and can therefore veto any of the president’s proposed legislation. White House aides briefed that Mr Trump would acknowledge that, by vowing to “bridge old divisions” in an apparent reach across the political aisle. The president was due to call for agreement on bringing down prescription drug prices and improving infrastructure, even while making immigration reform a central theme, despite being a key point of contention. Lois Frankel, a Florida congresswoman and chair of the Democratic Women’s Working Group, led calls for her party’s female politicians to wear white – chosen for its association with the women’s suffrage movement. Yesterday morning, the most senior Republican and Democrat in the Senate gave assessments of the Trump presidency that laid bare the division. Mitch McConnell, the Republican leader, touted the “immense progress” achieved since Mr Trump took office, citing the booming US economy. 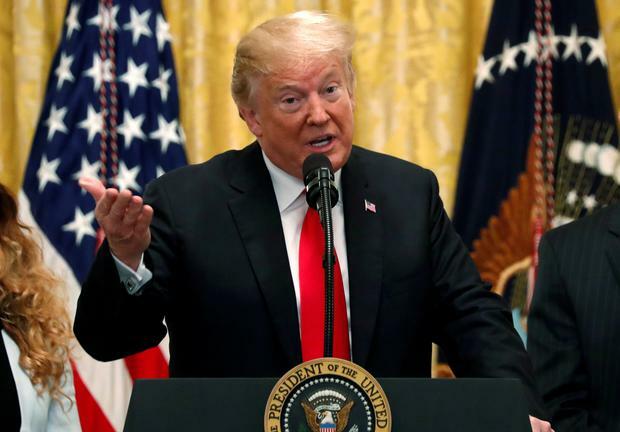 Mr Trump was set to deliver a speech challenging Democrats to approve funding for his long-sought border wall, but stopping short of declaring a national emergency over it, at least for now. Before a joint session of Congress, Mr Trump was expected to stir contention with remarks on immigration policy, after his demand for $5.7bn (€5bn) in wall funds triggered a historic 35-day partial government shutdown. Millions of Americans were expected to watch the address on television, giving the Republican president his biggest opportunity to date to explain why he believes a barrier is needed on the US southern border with Mexico. The speech was delayed for a week because of the shutdown, which ended on January 25. As Mr Trump took centre stage in the chamber of the House of Representatives for the big speech, sitting behind him was expected to be his main congressional adversary, Nancy Pelosi, the House speaker, who has shown no sign of budging from her fundamental opposition to the president’s wall-funding demand.